Greywater / Grey Water (or Graywater for US visitors) is water which has been used for washing and can potentially be reused rather than sent straight down the drains. Grey water includes water from laundry, dishwashers, baths, showers, hand washing etc, but does not include toilet waste (commonly called black water). It is best not to use kitchen sink waste water either as this often contains traces of grease, fats, meat, fish, and oils. This water can be put to use for toilet flushing and for watering the garden. It seems crazy to many to use treated drinking water to water the plants, and grey water together with rainwater collected from gutters is the perfect solution. 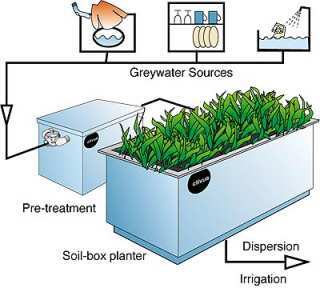 Collecting greywater is very simple. All that is required is a suitable Greywater Diverter Valve (click link to find out more). This enables the home-owner to choose whether to send waste water down the drain or to send it to the greywater storage vessel. Such an option is very important since there are times when bleach and other chemical cleaners are going to go down the plug hole, or when the greywater storage is full, when the waste water should not be collected. 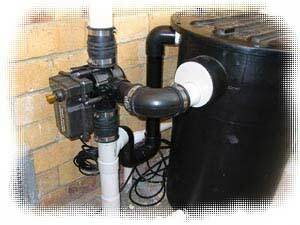 A cheaper alternative is a used bathwater syphon which connects directly to a hosepipe. If you intend to use untreated greywater in your garden then it is essential to reduce the amount of fertilizer you use. Soaps and washing powders contain nutrients such as nitrogen and phosphorous, which should be removed if you intend to use large quantities of grey water in the garden. Grey water watering systems should be installed under the ground (sub surface irrigation – the most efficient way to water plants) since greywater can contain disease-causing pathogens which you don’t want to spray around your garden. You should avoid using grey water on your vegetable patch if you intend to eat any of your crop raw or lightly cooked (including herbs and fruits) unless you first filter the water well using a DIY sand filter or commercial alternative. Greywater tends to be alkaline, whereas collected rain water is acid. Therefore it is necessary to understand which plants thrive in which conditions and to organise your garden and watering accordingly. Treating greywater typically involves passing it through a filter to remove any solids, disinfection by the addition of a small amount of a chlorine bleach, and then a period of sitting in a settling tank to cool. Solid particles sink to the bottom, oils and fats rise to the top, and the water in the middle is the treated greywater. More complex systems are possible involving sand and gravel. The addition of an electric pump or an aerator can be used to oxygenate the greywater before use which makes it much better for irrigation. Greywater must not be put into the toilet tank (cistern) in case a drop in water pressure causes it to enter the fresh water supply. Instead the greywater must be sent directly to the toilet bowl via separate plumbing.